These high-level tax events to the Third International Conference on Financing for Development (FfD) were organised by the OECD and Global Forum, in partnership with UN-DESA and UNDP. They provided a critical opportunity to bring together senior level figures from governments, regional tax organisations and civil society to discuss the future developments of the TIWB initiative, BEPS, and exchange of tax information. 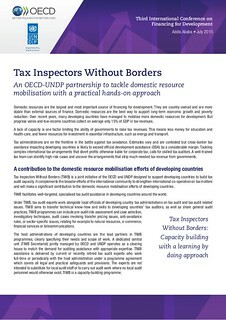 This session was the official launch of the Tax (TIWB) initiative and the TIWB-partnership between the OECD and UNDP for the execution of the programme. It took place on 13 July from 18:15-19:45 in Sholla 1 room, Hotel Radison Blu, Addis Ababa, Ethiopia. TIWB is a new capacity building initiative through which developing country tax administrations are assisted by tax audit experts in selecting and performing actual tax audits, bridging the gap between theory and practice. Speeches by Angel Gurría, OECD Secretary-General and Helen Clark, Administrator of the UNDP. 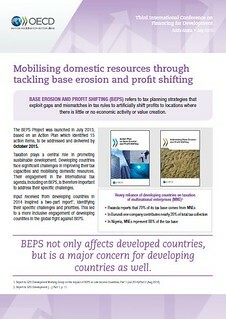 Base Erosion and Profit Shifting (BEPS) is of major significance for developing countries due to their heavy reliance on corporate income tax. An inclusive approach and the input of developing countries are needed to ensure the specific challenges they face are taken into account in designing BEPS solutions. This event, organised by the OECD in partnership with UN-DESA, aimed at raising awareness on the impact of BEPS on developing countries and how the OECD/G20 BEPS Project is tackling BEPS as a collective international effort. It took place on 14 July from 18:15-19:45 in Mars meeting room, Hotel Elilly, Addis Ababa, Ethiopia. The challenge of tackling international tax evasion does not fall to one country alone and there is no single answer to it. The numbers regarding illicit financial flows from developing countries, of which tax evasion is a part, are significant but attention also needs to be focused on the solutions to this problem and on strengthening domestic resource mobilisation. 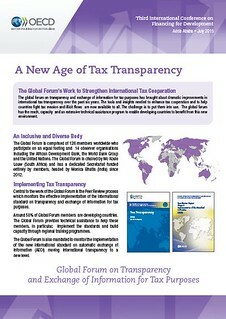 Following dramatic improvements in international tax transparency over the last 5 years, the tools and insights needed to enhance transparency and tackle international tax evasion are now available to all, including the smallest and least developed countries. The challenge now is to put them into use. This session aimed to raise awareness of the importance for developing countries of seizing the opportunity that now exists to benefit from these improvements in international tax transparency.